Join voice actor and writer Nikolle Doolin as she brings the pages of classic literature to life in this engaging literary podcast. Enjoy a myriad of great authors such as: Jane Austen, Edith Wharton, Henry James, Emily Dickinson, Edgar Allan Poe, Shakespeare, and many more. In addition to her podcast, Nikolle has performed voice-overs for various mediums (audio book, podcast, e-learning, game, film, video, and radio) and has performed contemporary narrations for a number of popular and award-winning podcasts, such as: The NoSleep Podcast, Far-Fetched Fables, Tales To Terrify, and StarShipSofa. To learn more, visit nikolledoolin.com or follow Nikolle on twitter @NikolleDoolin. 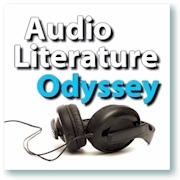 Audio Literature Odyssey is included in numerous recommendation lists for audio books and for students of literature and the English language.